US Geologic Survey team measuring water flow on the Trent River. Aerial photo of the confluence of the Trent and Neuse Rivers. East is up. 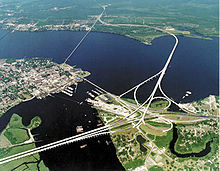 The city of New Bern is on the left. The unincorporated community of James City is to the lower right. The Trent River is a fresh water river of the coastal plain region of eastern North Carolina. It flows in an easterly direction from its origin approximately 15 miles (24 km) southwest of Kinston, North Carolina and traverses portions of Lenoir County, Jones County and Craven County prior to emptying into the Neuse River at New Bern, North Carolina. Trenton and Pollocksville are small towns that lie along its course. The river measures 720 yards (660 m) at its widest point and is fed by numerous fresh water branches and creeks along its length. This article related to a river in North Carolina is a stub. You can help Wikipedia by expanding it. This page was last edited on 2 March 2018, at 11:22 (UTC).